Posted: September 19, 2014 | Author: thelondoncolumn | Filed under: Architectural, Class, Dereliction, Graffiti, Housing, Interiors, Lettering, London Labour, Monumental, Vanishings | Tags: Balfron Tower, gentrification, James Wakefield, Michael Mulcahy, Mike Seaborne, Peter Luck, Trellick Tower |Comments Off on Balfron remembered. Balfron Tower. I love it. 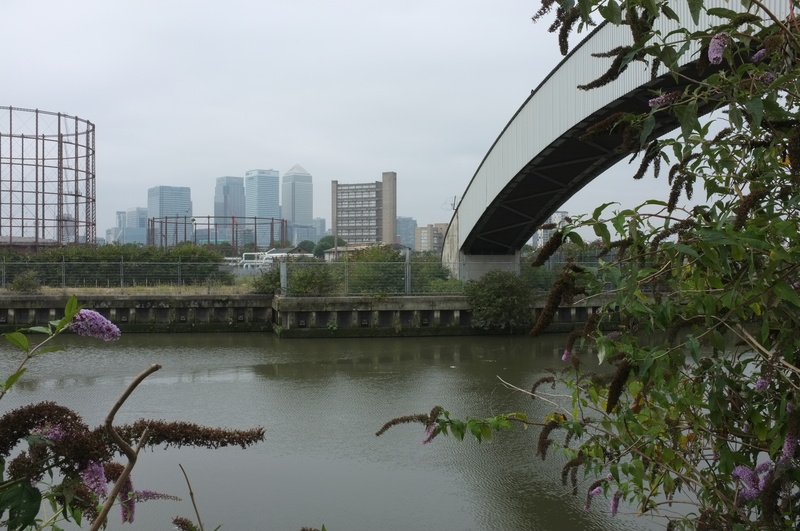 It anchors Poplar, it looms over the A12 just by the Blackwall Tunnel approach, and it seems to defend that whole end of Tower Hamlets. In the evenings, when the sun reaches a certain point, it glows golden. You couldn’t help but find it beautiful, its slightly Escher-esque planes and shapes and perspectives changing with the weather and the light, its strange humanity, its arrow-slit windows. Just as the now-demolished gasometers in Stepney did, it casts its grandeur over everything around. Balfron Tower. © Peter Luck. Poor Balfron suffers the slings and arrows of public disgust towards its whole genre. People think ‘the New Brutalism’ is called that just because it’s brutal, but in fact, it’s a play on the French term ‘béton brut’, for raw concrete. It’s easy to forget now that when this architecture went up, it was intended to make life better for people. 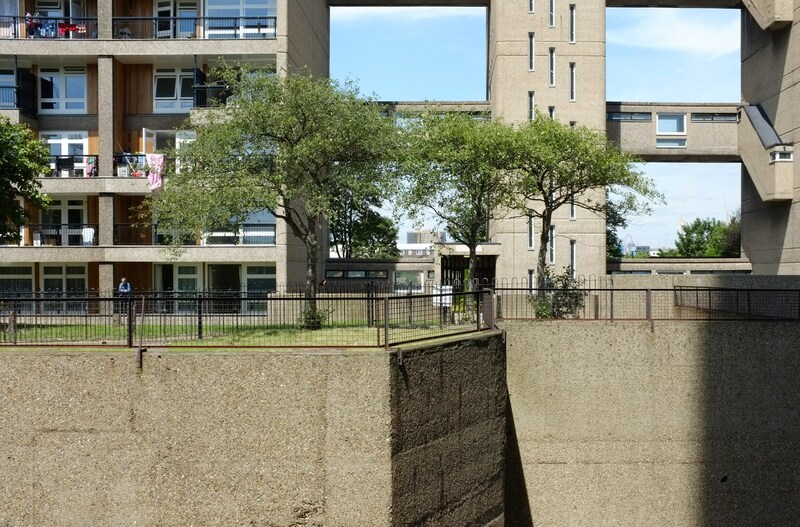 Goldfinger referred to its corridors as ‘streets in the sky’, and the plan included incredibly optimistic landscaping: Balfron has private yards for the bottom flats, mature trees and shrubberies shielding it from the A12, and light coming at it from all directions. Its flats meander up and down levels, and have balconies and stupendous views. The flats themselves are large by tower-block standards, & packed with space-saving devices. … Doors of wood & glass slide rather than open out, & can be used to partition certain parts of each flat. Glass is plentiful in order to let in as much natural light as possible… Adjoining the main tower is a service tower. This incorporates lifts, stairs, & refuse chutes, as well as a boiler house. The lifts stop at every third floor, meaning that in some flats the bedrooms are above, & in some below, the entrance level. The flats have large balconies which, if you are high enough up, offer views across the North Downs. My own personal knowledge of Balfron Tower reached its zenith in 2001, when, as a publicity officer for Tower Hamlets’ housing department, I toured the place with a deputation from Trellick Tower, and a member of its resident management committee. The reason they were visiting was very simple: Trellick was in trouble and needed a major overhaul. (The figure given at the time was £9m to get it up to its original standard.) 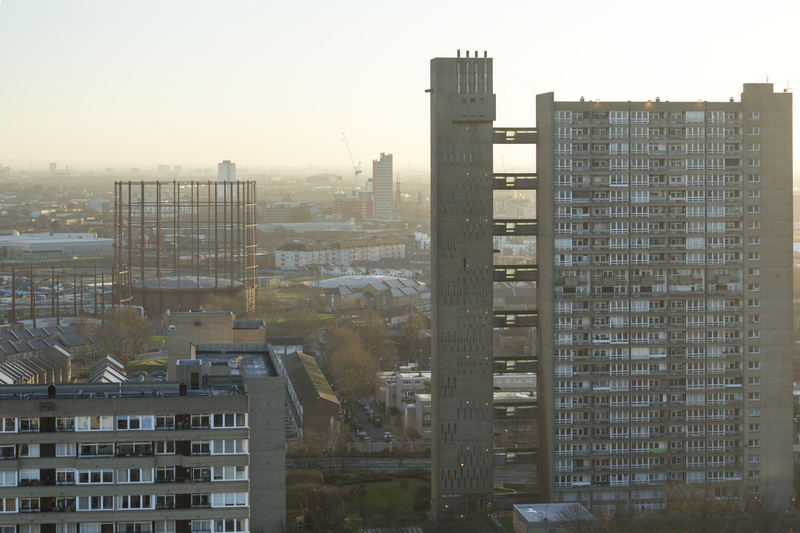 Balfron and Trellick are ‘sister buildings’; Goldfinger learned some lessons from Balfron, but by 2001 they were like twins raised separately. Trellick had, being in (even if only north) Kensington, been gentrified while the East End was still thought of as a wild space. Its tenants were that bit more prosperous, and more able to get mortgages, and had bought their flats under Right to Buy. However, many new owners didn’t have the money to maintain the flats – or else they did have the money, and took out original features. Kensington’s reputation for affluence got in the way of attempts to secure funding. They had a vandalism problem, and some of the original features – such as the marble that had been in the entry area – had been stolen. The building had been designed to have a concierge but for many years it never had one. No one was – literally – keeping an eye on things. It was in a bad spot. Balfron Tower. © Mike Seaborne. Balfron, by contrast, had had a boring life, with tenants instead of leaseholders, and with several rounds of major works on it – new windows, for example, and new asphalt in the external linking walkways. It also had more of its original features, like the quarry tiles lining the corridors – different colours on different floors – and its flats had more of their original fittings – for example their bakelite light switches instead of Thatcherite gold-look ones. And Balfron had had one asset money can’t buy: it had had one very hands-on, community-spirited caretaker for almost twenty years. I interviewed Irvine Gallagher, otherwise known as Jock, for the council’s newspaper, East End Life, around the time of this tour of the block. (I knew him a bit to have a drink with; when I rang him to suggest the interview, there was a long silence, and then he growled: ‘IN THE PUB.’) He told me, ‘When we took over this estate from the good old GLC it was a disaster area. Burnt-out cars, black soot stains, bin rooms full of old rubbish’. 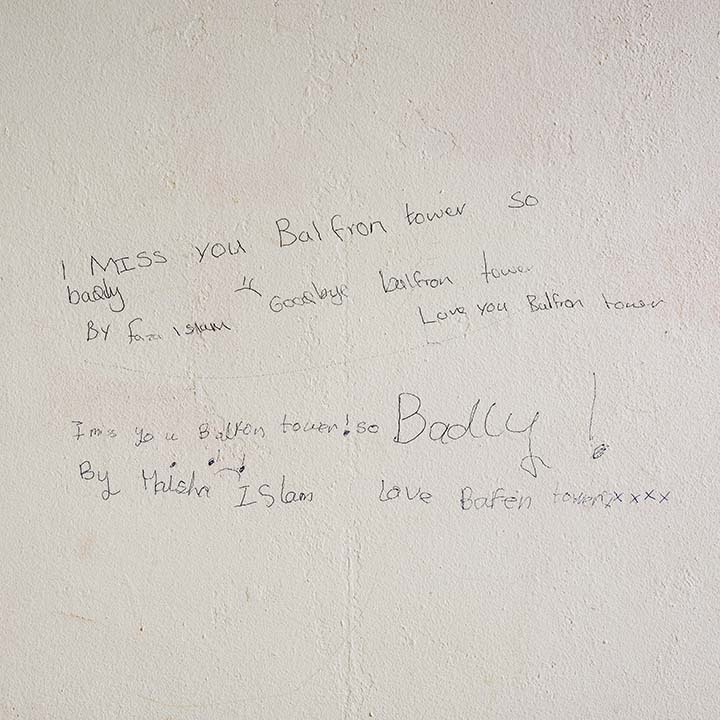 ‘No one knows as much as me about Balfron Tower’, he said. ‘I know how the whole building works, where everything is. I’ve had calls from housing management, architects, heating engineers. They wanted to put in new central heating but it’s listed, they couldn’t run the gas pipes up the outside – I identified where the cupboards were, and internal routes where they could run their pipes. I know how the flats fit together, this one on one level, this one on two – I always know where the water’s coming from’. Jock was a people person, though, as well as being able to do 3D mental mapping. ‘I know everything that happens here’, he said. ‘Everybody knows me and I know everybody . I know all the kids, who their mums and dads are. I’ll knock on someone’s door if I’ve seen them doing something. Nine times out of ten people are grateful and say they didn’t know their kid was doing whatever. Happy days. Also around the time of this interview, Jock had to apply for his job, as the council was bringing in ‘super-caretakers’ – a sort of Blairite caretaker-manager position. I spoke to him right after his interview and he said it had gone really badly. It lasted five minutes. So the job went to someone else, and Jock became an under-caretaker, and I heard last year that he had recently passed on. My other personal connection with Balfron Tower is that when I was working in that job, my marriage had broken up and my children and I were living in adorable but extreme overcrowding in a wisteria-garlanded one-bedroom flat in Hackney. Things were difficult, and at just this juncture a flat came on the market in Balfron Tower for something like £37,900. But Balfron was in Poplar, and my kid were in school in Stoke Newington, and you couldn’t raise a mortgage in Poplar (or a tower block) to save your life, and I had no savings at all… In one corner of my brain I have always lived there. I left that job few months after the Balfron tour and the interview with Jock, and have no idea how Balfron Tower fell into the situation it’s in today. It’s about to have the makeover of a lifetime, which will also catapult it into a new social class. Indeed, as life imitates art, the millennial city imitates the famous ‘I Love My Life as a Dickhead’ video, wherein the hipsters have taken over Trellick Tower. 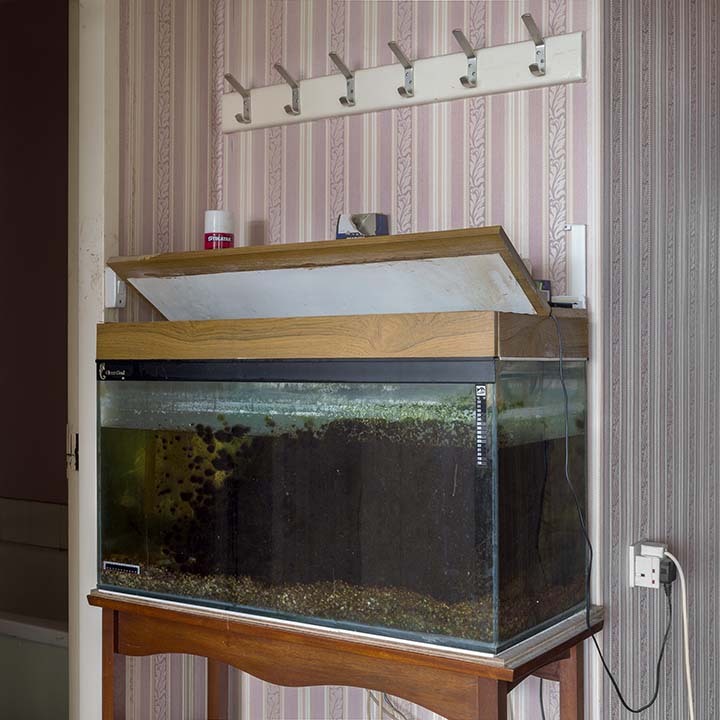 For with the ensuing works, and the the huge project of decanting all of Balfron’s tenants underway, Balfron’s flats have been let all year at cheap rents to artists, to keep the place full – and, presumably, soften up a tiny little social transformation. Balfron went to sleep as a brave and plucky social housing experiment; is currently dreaming a strange technicolor dream; and will wake up, what only feels like a lifetime later, a princess. And it’s some slight consolation to know that, if I had bought that flat all those years ago, I’d have a big headache just about now. 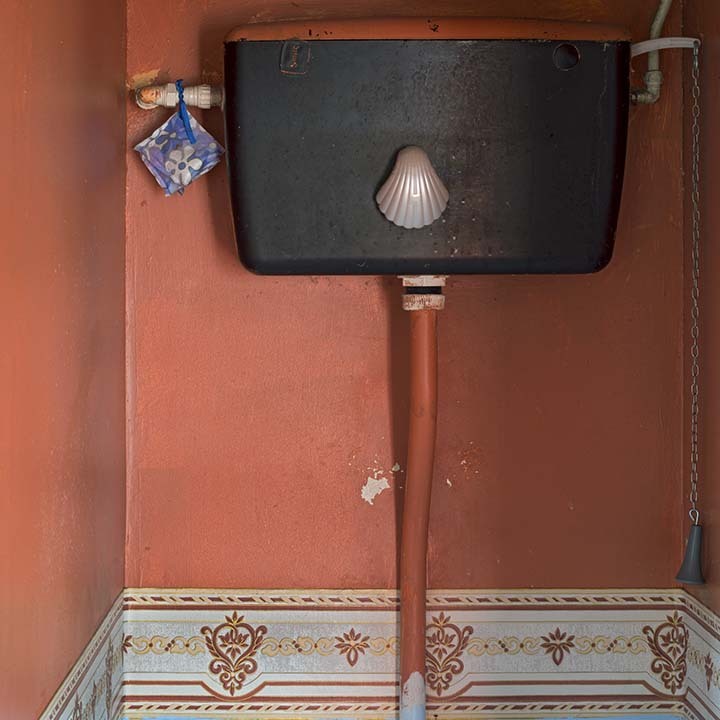 The photos are from the exhibition Balfron Tower An Unrealised Future, featuring work by photographers Michael Mulcahy, Mike Seaborne, Peter Luck and James Wakefield. 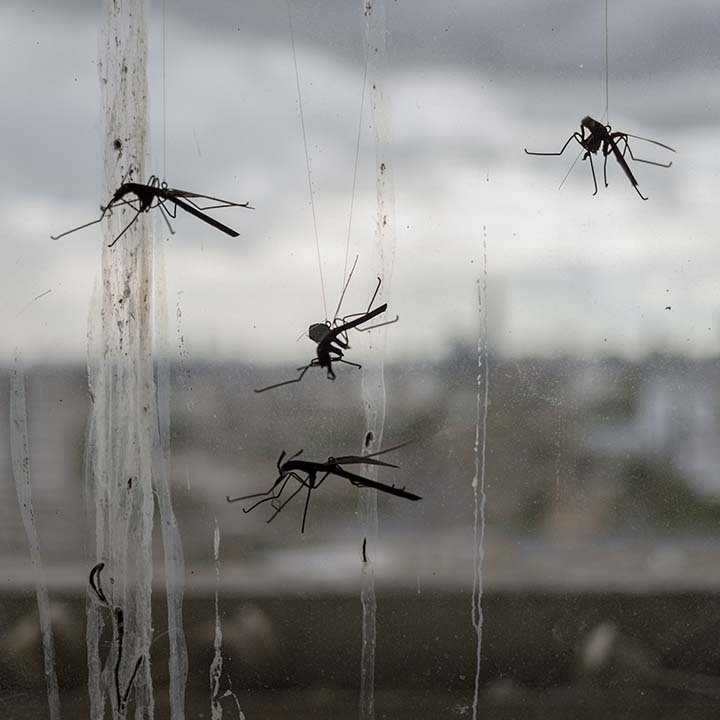 This runs until this Sunday (21st September), 12 – 6 pm at Flat 89, Balfron Tower, Poplar, E14 0QT (2 min. walk from All Saints DLR). Buzz flat 89 for entry.